Representatives of FCA, Honda, Toyota and Nissan all confirmed Thursday that malfunction indicator lights are not triggered by every diagnostic trouble code. Chris Tobie of Honda, Justin Miller of Nissan, John Hughes of FCA and Eric Mendoza of Toyota also all confirmed that scanning requirements were already present in repair procedures prior to the four OEMs’ diagnostics position statements this summer. All four men said DTCs can be encountered on models from their companies dating at least as far as the 1990s. 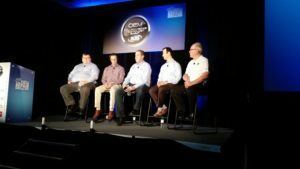 Tobie, Miller and Mendoza all laid such industry misconceptions to rest during the Society of Collision Repair Specialists OEM Collision Repair Technology Summit at SEMA. Hughes confirmed the same with a mix of comments made during the panel discussion and in a post-forum interview with Repairer Driven News. Hughes, whose company was the first this year to issue a position statement, said Thursday the requirement to scan FCA cars existed in service manuals before the June document. He said FCA didn’t put specific model years because “you need a VIN number to tell what’s on that vehicle.” However, FCA trouble codes can be encountered at least as far back the 1990s, he confirmed after the meeting. The question of model years had been raised by insurers, who wondered how far back scanning had been necessary. “I thought it was pretty clear,” he continued, drawing laughter. He said he clarified it further in an Infiniti position statement to explain that “anything that can be plugged in with the console and read” — essentially, everything with the OBD-II port — should be scanned. “That would apply to Nissan as well,” he said. Though the OBD-II standard was required on all 1996 model-year vehicles in the U.S., Nissan had two 1995 models as well requiring scans, Miller said. “That’s been standard for almost 30 years now, that you have to do that,” he said. Collision repair was even more complicated from a diagnostics basis, according to Tobie. DTCs had historically been designed as “one failure, one fix” for mechanics, he said — a single code is thrown, and you know what’s not working. But in a collision, an unknown number of systems could be damaged by an unknown amount of force, he said. Mendoza said Toyota in the mid-1990s decided to use the malfunction light for customers and provide DTCs for technicians. Tobie agreed. “They are not diagnostic tools,” he said of malfunction dash lights. The Honda Fit — Honda’s cheapest offering — can have up to 510 diagnostic trouble codes, and “ony a certyain percentage of those actually turn a light on.” he said. A fully loaded, optioned out version of a model like a Pilot can have 1,000 codes, Tobie said. Hughes said he researched another FCA vehicle for a similar panel and found that it had 13 malfunction dash lights. But it had about 1,000 diagnostic trouble codes, only about 10-13 percent of which triggered a dashboard light. Same for Nissan, Miller indicated. He noted that many insurance companies base a decision about whether to perform a post-repair scan on the presence of a dashboard light. “That should not be the deciding factor,” he said.